Sustunable is the first to provide to Europe’s retailers and consumers – an on-line tracking system which enables tracing back the consumed tuna from: “Throat to Boat”. An advanced custom-build supply chain management system which unites all partners – enables clear and efficient communications to ensure reliability in deliveries. Each boat will carry at all times an on-board independent observer- whom will record and report any tuna catch and the by-catch on paper to the competent Regional management organization. Each tuna boat will be equipped with special nets to prevent any harm to dolphins – and crew should be trained to perform procedures to avoid any dolphin mortality. All boats will fully comply with the guidelines and regulations issued by the competent Regional Fisheries management Organization. No transshipments between fishing vessels of any tuna will take place on the open seas. Only land based – monitored transshipments are allowed to take place – guaranteeing full traceability. The intention is deliver fish directly from fishing vessels hold to the tuna processing facility. Throughout the entire tuna supply chain full transparency and traceability will be guaranteed – from “Boat to Throat” . 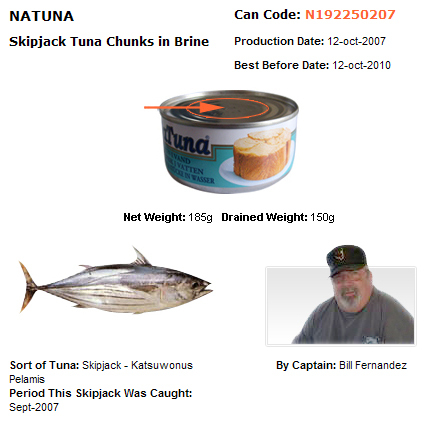 Based on the production codes marked on each individual packaging starting from April 1st 2008 – buyers and consumers will be able to trace back each cancode to the vessel – captain – responsible fishing method and catching area via a public on-line internet system. Sustunable has invested in an advanced custom build supply chain management systems that is run by highly skilled people, who ensure that customers can rely on timely deliveries that can maintain their efficiency and service. Our automated electronic information system , keeps all partners throughout the production and the delivery chain posted on every important development – with the human touch. Copyright © 2018. All rights reserved Sustunable.